America's Mitsubishi Galants are built at Mitsubishi's manufacturing plant in Normal, Illinois, one of the most complex automotive factories on the planet. The new Galant is based on an all-new platform and designed by Americans to meet the needs of the North American market, the Galant's mechanical design employs cutting-edge engineering and manufacturing technologies that result in a superior vehicle. Above all, the Galant makes a resounding statement about its driver by combining bold, modern, and uniquely Mitsubishi interpretations of what a mid-size sedan should be. The Normal facility also produces Endeavor (excuse the American spelling), Eclipse, and Spyder. 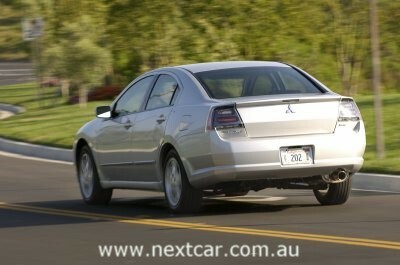 Mitsubishi designers focused much of their attention on further enriching the Galant's interior. America's mid-size sedan buyers will notice the many subtle, meticulously selected enhancements that clearly distinguish the appearance and atmosphere of the vehicle's cabin from others in its class. The vehicle stays true to its roots, however, built to attract family sedan consumers with family-sized needs. 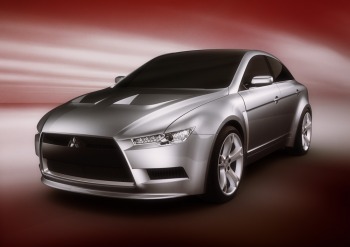 "We listened to the market and added a variety of new and improved features to the 2006 Galant to make it a more competitive mid-size model," said Rich Gilligan, president and chief executive officer of Mitsubishi Motors North America, Inc. (MMNA). A vehicle's fundamental quality comes from its chassis, and the 2006 Galant is carved from a solid foundation. From the floorpan to the roof, the Galant has a stronger and more rigid platform than any previous generation. Every opening in the body, including doors, boot and engine compartment, is reinforced to help resist the bending and twisting forces that are exerted on a moving automobile. The body employs higher tensile strength steel panels to reduce body weight and increase body rigidity. The Galant's robust structure is key to its crash safety ratings, ride quality, handling feel and overall refinement. For the American market, this five-passenger, four-door sedan is powered by a choice of two robust engines designed to produce the majority of torque at lower revolutions. All Galants are equipped with a four-speed automatic transmission, and the V-6 equipped LS and GTS trim lines also benefit from a Sportronic(TM) mode that allows drivers to manually engage their desired gear. Along with offering a comfortable ride, a successful midsize sedan needs to be able to offer seating and cargo capacity for everyday needs. 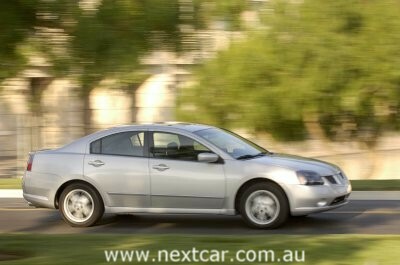 To facilitate passenger entry and exit, the Galant's height is 57.9 inches (58.1 inches for GTS). Thanks to its stretched wheelbase, rear legroom is a generous 37 inches, providing comfort during the drive as well as more room to maneuver when entering or exiting. The Galant provides 57.1 inches of shoulder space for rear passengers. The driver and passenger view the road from an elevated position on comfortable front seats that are among the widest in the class. Passenger comfort is enhanced by a thoughtfully designed and well-tuned chassis, which combined with efficient fuel economy, makes the Galant an ideal vehicle for long drives. An intelligently designed rear suspension utilizes a low-mounted multi-link configuration which not only creates an excellent ride and stable handling, but also helps reduce road noise and improves quietness by adopting a resilient cross member. The easy-to-operate trunk lid - complete with an interior handle - swings up to offer a large cargo area, and the boot hinges are designed not to intrude on the available cargo space. And to minimise hassle, the boot features a wide opening and the low lift-over. The Galant's exterior design makes a bold visual statement about the product and the person who owns it by distinguishing itself from the traditional, ultra-conservative styling of most four-door sedans. The vehicle's athletic wheel arches, European-inspired front fascia treatment, and long, arching C-pillar help the Galant break from the three-box school of sedan design. The Galant's purposeful front and rear bumpers help communicate an image of strength and safety. Its strong visual silhouette is wedge-shaped, highlighted by a waistline that rises toward the boot lid. Viewed from the front, the larger mudguards help accommodate the wide 61.8-inch track and reinforce the Galant's bold hunkered-down stance. Large lower air intakes in the front fascia also help convey an image of aggressiveness and purpose. 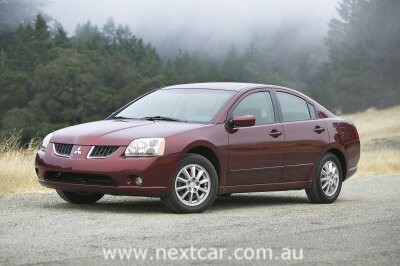 For 2006, the Galant's wheels have been updated to complement the vehicle's distinctive position in the category. The Galant DE and the ES feature 16-inch steel wheels with new 8-spoke wheel covers, while the Galant LS trim line features new 16-inch alloy multi-spoke wheels standard. The GTS has 17-inch 5-spoke aluminium alloy wheels. The Galant's interior exemplifies the Mitsubishi brand's spirited product virtues by offering a stylish, upscale atmosphere. Its dashboard is dominated by sculpted, modern, architectural form housing user-friendly, intuitive controls for both the driver and the front passenger. The centre dash features a prominent climate and audio control stack that was designed to resemble a modern, high-tech home audio interface with large control knobs. Style enhancements include chrome ring accents on the meter cluster and HVAC black colour control knobs, as well as a new black metallic finish for the centre audio panel. Atop this centre panel is an available 4.9-inch colour LCD display that provides climate and directional information, as well as a new-for-2006 drive computer that features mileage information, a door alarm indicator, maintenance recorder, compass and calendar. The display even functions as an interface that can allow owners to customise many of the vehicle's interior functions. At night, the gauges, audio panel, interior control knobs, and switches are illuminated with striking ice-blue LED lamps that help create a sophisticated interior ambience. 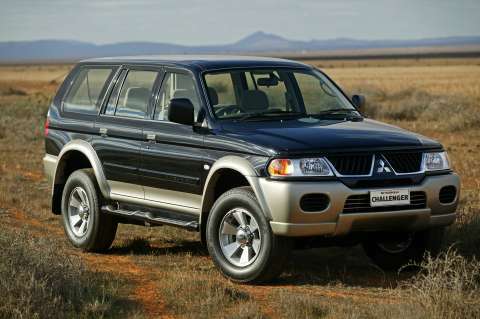 For 2006, Mitsubishi designers also added a bright, silver metallic finish to the inner door lever, radio buttons and vertical and horizontal accent panels on the ES, LS, and GTS trim lines. Storage capacity was an interior design priority on the Galant, as evidenced by a large-capacity glove box and the numerous secondary storage compartments. The intelligently designed centre console includes a pair of large-volume cup holders, while other spaces are capable of holding cell phones and sunglasses. The Galant's door panels are covered in modern, padded and textured materials that match the seat covering and instrument panel. The front door panels include large door pockets ideally sized for large map books, and the rear door panels feature a space large enough to hold portable electronic games, juice boxes or other travel items. The Galant's plush seats offer generous shoulder and hip room for superior comfort. Depending on the trim level, they are covered in cloth, premium fabric or leather and they feature deep accent lines to help emphasise the seat width. Leather seat coverings, standard equipment on Galant GTS, are available as part of an option package on the Galant ES and LS. In the interest of reducing fatigue and increasing comfort during drives, the Galant is equipped with ideally positioned door panel armrests, a centre console armrest pad and a rear folding armrest complete with cup holders. The Galant also has been updated with a new remote keyless entry system on all models and the ES, LS and GTS trim lines have added MP3 playback capability to the base CD and premium Mitsubishi/Infinity(R); audio systems. America's Galant is powered by one of two engines. 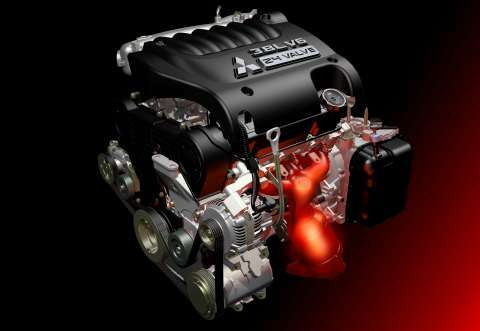 A responsive 2.4-litre inline four-cylinder engine, standard on the DE and ES trim lines, develops 160 horsepower and 157 pound-feet of torque, thanks to Mitsubishi Innovative Valve timing and lift Electronic Control (MIVEC) system. Through this system, which makes use of different sized cam lobes to increase lift for continuous power, even the entry level Galant achieves a high level of performance. But for anyone who equates high power with luxury, the LS and GTS trim lines offer just that. Both offer a standard 3.8-litre, 60-degree, SOHC V6 engine that is ideally suited to provide brisk acceleration for spirited driving while maintaining efficient fuel economy. Rated at 230 horsepower at 5,250 rpm, with peak torque of 250 pound-feet at 4,000 rpm, the Galant's V6 provides plenty of power and tremendous torque from a wide part of its rev range. The engine's intake and exhaust events are tuned to achieve maximum torque early in the rev range where the engine will spend the most time. The Galant's 3.8-litre V6 engine is mated to a sophisticated four-speed automatic transmission with Sportronic(TM) shifting. The transmission features fully adaptive shift control that "learns" driver inputs and tailors transmission operation to their habits. Both engines are mated to transmissions equipped with final drive ratios optimised to improve the vehicles off-the-line acceleration. And the gear ratios are also well suited for highway performance. The Galant's four-wheel independent suspension was designed to provide superior stability, excellent ride quality and nimble handling. The Galant utilises a proven MacPherson strut design front suspension. A large, rigid cross member minimises the torsional flexing forces of the front sub-frame, improving suspension performance while also reducing noise, vibration and harshness. The Galant's rear suspension utilizes a low-mounted, multi-link configuration with trailing arms. Stiff hydro-formed cross members also help reduce road noise and improve suspension performance by reinforcing the rear suspension mounting points to reduce flex. The Galant's wide, 61.8-inch (1,570 mm) front and rear track endow this broad vehicle with superior stability and control. And in the interest of handling, ride quality and style, the Galant is equipped with either 16-inch wheels with 215/60R16 tyres or 17-inch wheels wrapped in wide 215/55R17 rubber. The Galant utilises a proven power rack-and-pinion steering system that is designed to provide the direct feeling and response of a sports car, while the system's effort multiplication provides the low-speed steering control that makes parking and low-speed maneuvering so easy. Reinforced side sill members also help disperse energy in the event of a collision. High-strength steel cross members across the floor absorb side impact energy and help protect occupants. In the interest of front passenger safety, the Galant is equipped with advanced front seat-mounted, side-impact air bags with occupant sensors. The Galant also offers standard front seat-mounted, side-impact air bags designed to help protect the occupant's head in the event of a collision. Pretensioning seat belts with force limiters are standard equipment on all Galants. Extensive use of energy absorbing materials appear on the interior and headliner and are used to cover the inside of the front center and C-pillars to help reduce the possibility of injury during a collision. All Galants utilise four-wheel disc brakes. The front ventilated discs measure 10.9 inches (upgraded to 11.6 inches on the LS and GTS). Rear brakes are 10.3-inch solid discs. Coupled with available ABS (standard on ES, LS and GTS) and EBD systems, the Galant's powerful brakes provide excellent control during panic stops and on rain-soaked roads. For 2006, Galant ES, LS and GTS models equipped with alloy wheels feature a tyre pressure monitor system that alerts driver when tyre pressure is low. An anti-theft alarm system also is included with the optional Audio Package for the ES and LS, and standard on the GTS trimline. Available on ES and LS models, the Galant's new Audio Package - purchased in conjunction with the Leather Package - features a 270-watt Mitsubishi/Infinity(R) AM/FM/six-disc CD changer with MP3 playback, eight speakers, anti-theft alarm system and sport-wrap steering wheel with audio controls.